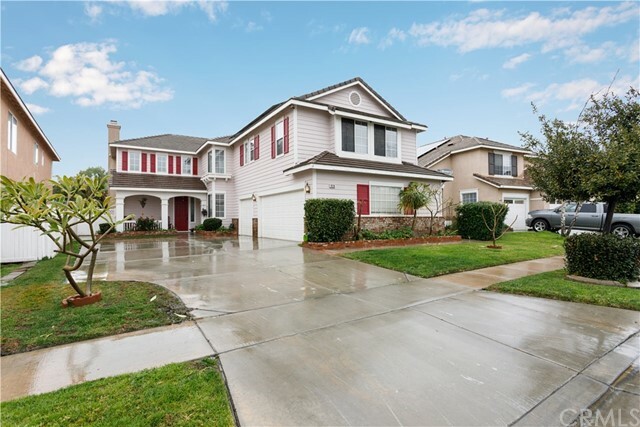 Beautiful 5 Bedroom 3 Bath home located in Corona Ranch. Very open floor plan with 2 fireplaces and wood flooring downstairs and an additional fireplace in the Master Bedroom. The kitchen has a beautiful island, new countertops, new backsplash and lots of cabinet storage. Family room has wired surround sound and the living room has cathedral ceilings and windows with plantation shutters. Located on the main floor downstairs there is a bedroom and bathroom. The laundry room also has a sink. The Master Bedroom Suite is very spacious and has its own fireplace and private balcony that overlooks the beautiful city lights. The Master Bathroom is spacious and has a beautiful walk in closet with custom closet storage. There are 3 additional bedrooms upstairs that all have walk in closets. The home also has a built-in intercom system and whole house vacuum system. The Backyard features a mini pool/Jacuzzi with waterfall. The garage is a 3-car garage with built in cabinets. This home also has solar. Located in the desirable Corona Ranch neighborhood and is walking distance to Corona Ranch Elementary School and Village Park. This amazing home is located close to freeways and shopping. This is a gorgeous property! You dont want to miss this opportunity!